← Happiness available for $650 /pound. Thinking of Mike Holey, an Aviator and a friend. I would like to share a few notes with you about my friend Mike Holey. An extraordinary aviator, one of the best pilots I have ever met, and probably the finest aircraft mechanic I have ever worked with. If that sounds a little lofty, consider just one page from his logbook: In 1998 he prepped a Soviet AN-2 biplane and flew it east to west across the North Atlantic, including an 11 hour IFR leg between Keflavik and diverting to Thule. He was the person who convinced me to become an A&P, first person I ever told that I wanted to build a plane. He and I were the closest of friends for many years. If you like nice stories, stop reading right now….. because this story has a purpose and a message, but it doesn’t have a happy ending. 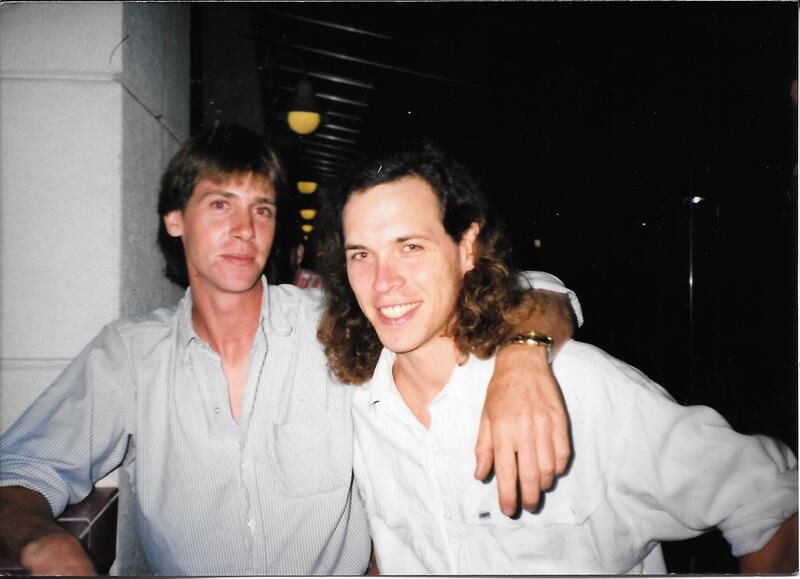 Above, a 1991 photo of Mike and myself outside the Ocean Deck in Daytona Beach. We met as students at Embry-Riddle. Putting aside aviation, Mike was the rare combination of a brilliant mind and a very empathetic heart. He was kind to a fault, to every person he met. He was rarely judgmental of the faults or failings of others, he extended this attitude to friends and strangers, but never to himself. He was the harshest of self critics, and he equated any leniency on that topic to dishonesty and weakness. It was self destructive, but it was his code. If you want to hear the things that were great about Mike, come find me at the end of the day at Oshkosh, pull up a lawn chair and a beer, and I will fill most of an evening with stories that are both moving and hilarious. But here, for the purpose of getting to the point I wish to share, I will spare the fun parts and cover the tragedy and its lesson. Mike’s childhood in Tom’s River NJ might have been unremarkable, except for a single incident when Mike was 15 that determined the course of his life, and lead to his death at age 39. On that day in 1979, Mike’s beloved stepfather, had a heart attack at home. Although Mike had received rudimentary instruction in CPR, he initially froze, and then forgot the sequence. Many people, honestly and kindly told young Mike that his stepfather would probably not have made it anyway. That would have worked on any average person, but Mike was not an average person, and to him including the word “Probably” meant that there had been a chance, and this was a ‘crime’ he would never allow himself to be forgiven for. Any attempt to rationalize what happened was just a dishonest evasion of responsibility. Imagine, just for a moment, a man who feels that way in his heart, every day of his adult life. You might think that Mike would have felt better than other people who spend every day of their lives trying to evade any responsibility for their actions, but he didn’t. All of the things that he accomplished and all the friends who loved him never changed Mike’s fundamental belief that he was no better than anyone else, and he had played a role in the death of a very good man. I met Mike during a five year period of sobriety in his life. They felt like golden years on the outside, but sobriety is a practice, and it is not the same as having come to terms with the question inside. When he was 16 Mike had succumbed to depression and very heavy drinking. He got several DUI’s in short order. His driver’s license was revoked for 10 years. Through extraordinary testimony offered by a number of senior pilots, the FAA actually was made to understand the individual, and they granted him a student license, with the provision that any infraction would be a lifetime revocation. Mike accepted these terms, granted himself a stay of execution, and went about becoming the aviator that most people knew him as. Things unraveled after we graduated from Embry-Riddle. Most of us dispersed to interesting jobs, and Mike could have also, if he had felt he deserved one. Mike went back to drinking, and in time he got the fateful DUI that lead to the revocation for life. While most of our friends were far away, Mike and I both lived in Daytona Beach. Because my closest friend in the world had taken his life in 1986, I understood what the worst outcome could be, in a way that others didn’t. for this reason, I devoted a number of years to trying anything to find Mike a path through his life. I bailed him out of Jail, took him to rehab, doctors, hired lawyers, spent every dollar I had and could borrow, listened to smart people and idiots, wrote a lot of letters, had him live at my house for years, and went and found him in many different places. I have a particularly disturbing memory of finding him at the Daytona bus station. He was lying on the ground, and in the dark I had walked past him several times, mistaking his crumpled figure for a bag of trash. I mention these things, because I want you to understand he was the kind of friend who was worth anything you could do. I do not feel better than other people for having done them. If he was your friend, you would have done them also. In 2003, I was holding a Corvair College in Texas. I am sitting at the dinner table with Oscar Zuniga and Gus Warren. Prep work isn’t going smoothly, the weather is terrible. I light heartedly say “What else could go wrong now?” A second later my cell phone rings and a friend tells me that Mike has shot and killed himself. It is at this moment, after 13 years of friendship, that I suddenly understand what the bond between us was. Each of us had previously not done enough to save the life of a good man. And now, I would have the rest of my life to ask if I had done enough for Mike. 12 years later, I still don’t have an answer that I believe when I am alone late at night. First I want to be very clear, that Mike was one of the most peaceful people I have ever met. I can’t think of a time when he raised his voice, and he would not form a fist, even to defend himself. When he was intoxicated, he became even more kind, he often gave away all his money to homeless people, and even gave his coat in feeezing weather to a young mother who was walking home. The fact his death is labeled a ‘violent crime’ is a grotesque distortion by thoughtless people and those with an agenda, neither of whom are contributing to solving depression issues. I actually started off ok, kindly explaining that the majority of gun deaths in America are suicides, and it was degrading to my friend’s memory for him to be considered a violent criminal statistically, I wanted him understood as a human who fought a very valiant battle with depression, exactly as you would see anyone who fought against cancer. I said that even if you could remove the tools of suicide, this isn’t doing a damn thing to give these people something to live for. Depression is a cage, and padding the bars is nothing to feel good about, the only fix is to find a way open the cage, and this means real, hard work, looking everything from biomedical chemistry to early childhood learning. Their response was to say “Well, I just don’t like guns.” And my reply was I don’t like stupid people who feel that pointless gestures that allow them to ‘feel better’ are and acceptable substitute for real understanding and human compassion when dealing with human beings who have potentially fatal diseases like cancer and depression. It would take an extraordinarily shallow person to believe that if we had just had one more gun law in Florida, that Mike would be alive today, enjoying life, happy and content, and merely supporting such legislation is all that is required to fulfill “I am my brothers keeper”, and allow them to walk past a crumpled figure at a bus station and feel they were addressing the issue of depression in our society. Contrary to what national media suggests, Florida has background checks, waiting peroids for handguns, and the harshest 10-20-life manditory sentencing. It has had these laws for decades, and they do nothing to help humans who live in the cage of depression. I have spent countless long nights considering what societies’ response to depression should be, and I have no complete answer, but I am sure that feeling good about one more law isn’t going to work. 5 Responses to Thinking of Mike Holey, an Aviator and a friend. William, That is a hard story with a very pointed truth, that many people do not want to face and recognize. I appreciate you sharing that with us, and especially your message being conveyed. I agree with you fully. William, I agree completely with you statement. So sorry about your friend there will always be a place for special people in your soul and yet a loss and emptiness as well. It is such a profound tragedy that the ones who do so much to help other people often seem to be beyond help themselves. Or, at the the least redirect any kindness that is bestowed upon them onto someone who they feel is more deserving. We can only do what we can, and pray that it is enough, and sometimes it is, but tragically sometimes it is not. And on the subject of passing yet another law to deal with a given situation; I equate people possessed of this opinion with those that feel that their show of support on Facebook somehow is equal to the efforts of those who deal with the situation at the expense of blood, tears, and mind. How can you legislate the actions of people that have already demonstrated that Law is not a limiting factor? In the recent California shootings, for example, murder is already illegal, so is the possession of a magazine holding more than 10 rounds in CA. Would one more law really stop this? william among other things I am a recovering alcoholic and drug addict [dont tell the FAA} its been 26.5 years since my last drink or drug, your description of your friends behavior and your response is depressingly familiar, the things you didnt see him do because you were not one of his fellow alcoholics is something you should be grateful you were spared its so much worse than you can possibly imagine. I doubt you will beleive me but I know as much about this disease as you do about airplanes and i can assure you there is nothing you could have done. Unless you think you could have locked him in your hour house forever and somehow controlled him totally, I have a 20 year old daughter going through this and if i could i would its simply not possible so i have done what i can as you did it very well one day may prove inadequate. Mike may have been whats called dual diagnosed meaning he may have been clinically depressed or bipolar as well as alcoholic its a bad combination but fairly common and they do exacerbate each other and make recovery twice as hard and then twice as complicated for a relapse in one often means a relapse in both. My daughter has both. Maybe one day geneticists will be able to edit out the sequences that lead to this disease but until then the only effective treatment i have ever seen yeild consistent results is AAs and its 12 steps but thats a very hard system to transmit its essentially trying to teach spiritual enlightenment not like teaching engine building. anyway you have about as much responsibility for not being able to save mike as he did for not being able to save his dad. Theres an alanon slogan you didnt cause it you cant cure it you cant control it. Other than your 24/7 work to insure more builders enjoy pure aviation safely, economically, and with the deep enrichment of hands on creativity, the best thing you can do for your friend and the memory of your friend is to genuinely forgive and like William. Period. Anything else is maudlin hogwash; forgiveable but not effective. Oh, and listen to Miss Grace, so well named.